The frittata might have been created with lazy people in mind. Essentially it's an omelet that you don't have to fold, and for those of us who can't wake up in the morning it's the ideal brunch recipe. It requires no heavy cooking or exact measurements. A frittata is perfect for breakfast, lunch or dinner...you don't even have to reheat the leftovers. Seriously, we're talking almost zero effort here. You need this in your life. You can't go wrong with a basic but flavorful frittata flavored with lemon zest and fresh basil, full of thinly sliced potatoes. Just add your favorite veggies, meat, seafood or cheese to customize the recipe to your liking. 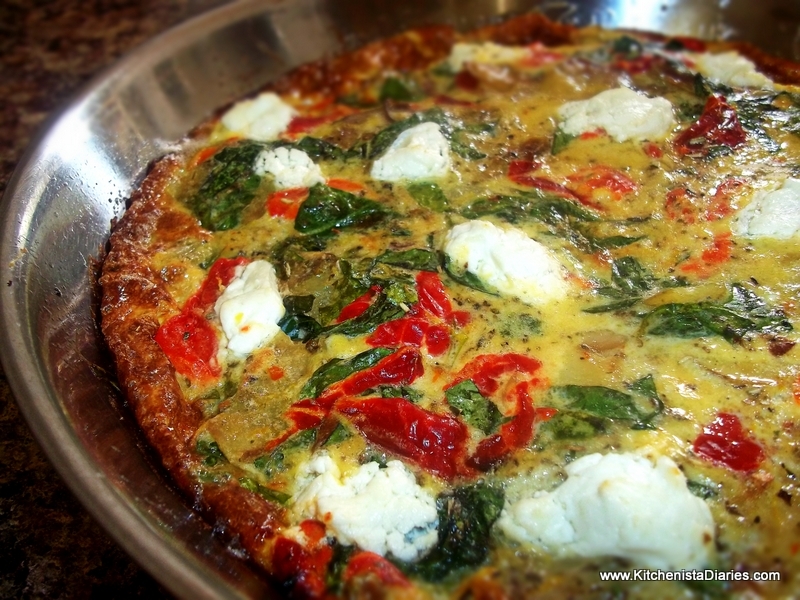 There are plenty of modifications you can make to this frittata recipe to meet any dietary restrictions or preferences. For instance, substitute egg whites for whole eggs, or use a combination of the two (my personal perference.) Although many frittatas are made with a ton of cheese, that's not necessary and neither is a lot of oil or butter. Likewise, most recipes call for a little milk or cream, which you can leave out or substitute with non-dairy options like coconut, almond or soy milk. When prepping your ingredients, a mandolin will get the job done faster and create potato slices thin enough to cook quickly. Use it to slice your onions as well. I purchased an inexpensive mandolin for about $30 last month which has already become an indispensable tool in the kitchen! Preheat the oven to 450°. You'll want to have all of your ingredients prepped ahead of time and close to the stove top. Heat your skillet to medium and add a couple tablespoons of olive oil. When the oil shimmers, add the potato slices to the pan and cook until tender and golden brown. Add the sliced onions and cook until translucent, then add the chopped garlic. Saute for a few minutes, adding a pinch of salt and pepper. Add the Italian seasoning and spinach to the pan, saute just until spinach wilts. In a small bowl, whisk together the eggs, milk and lemon zest. Gently stir in the roasted red pepper and basil, a 1/2 teaspoon of salt and a pinch of pepper. Check to make sure the skillet is still well oiled; if necessary add a drizzle of olive oil. Slowly pour the egg mixture into the skillet over the potatoes and spinach. Reduce heat to low and cook until eggs start are set, about 8-10 minutes. There is no need to stir or mix the eggs. Occasionally lift the edges of the frittata up to allow the raw egg to get redistributed. When the frittata is firm around the edges and the egg is slightly runny on top, add dollops of goat cheese. Carefully transfer the skillet to the oven, placing it on the middle rack cook. Cook for 5-7 minutes or until edges of the frittata are puffy and golden brown and the surface has cooked completely. Do not overcook! Using oven mitts, remove the skillet from the oven and allow to rest for a couple minutes before cutting. 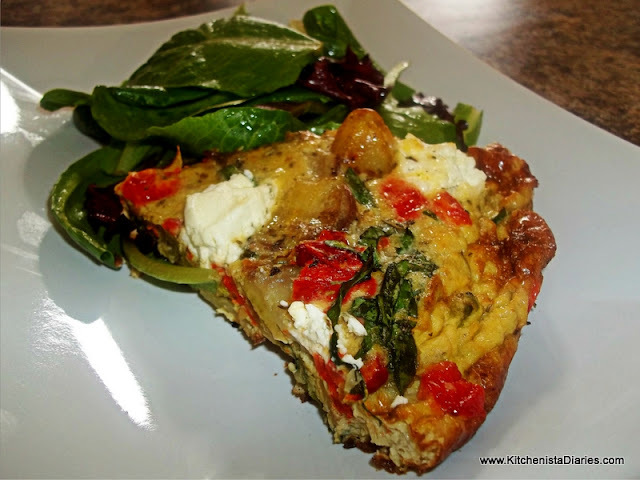 Frittata is great served with a simple side salad of mixed greens. Squeeze fresh lemon juice from the lemon you zested in this recipe, with a little olive oil & sea salt to make a quick vinaigrette!